The MAX4230 MAX4234 single/dual/quad, high-outputdrive CMOS op amps feature 200mA of peak output current, Rail-to-Rail input, and output capability from single 2.7V to 5.5V supply. These Amplifiers exhibit high slew rate of 10V/s and a gain-bandwidth product (GBWP) of 10MHz. 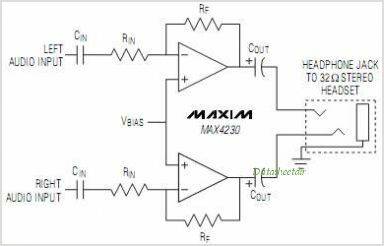 The MAX4230 MAX4234 CAN drive typical headset levels (32), as well as bias an RF Power Amplifier (PA) in Wireless handset applications. The MAX4230 comes in a tiny 5-pin SC70 package and the MAX4231 single with shutdown, is offered in the 6-pin SC70 package. The dual op-amp MAX4233 offered in the space-saving 10-bump chip-scale package (UCSP"), providing the smallest footprint area for a dual op amp with shutdown. The MAX4230 family offers low offsets, wide bandwidth, and high-output drive in a tiny 2.1mm x 2.0mm spacesaving SC70 package. These parts are offered over the automotive temperature range (-40C to +125C). This is one package pinout of MAX4233,If you need more pinouts please download MAX4233's pdf datasheet. This is one application circuit of MAX4233,If you need more circuits,please download MAX4233's pdf datasheet.